Parents: Stay Connected this Summer! Smugmug is going to be the best way for you to follow along with all the happenings during a week at camp. Nearly every day, our media team will be uploading all the photos they have of games, free time, chapel, cabin time, and other activities! PLCBC’s page is set up so that each camp session this summer has it’s own gallery, so all you have to do is click the box below, find your camper’s week, and check out all the fun going on at camp! You can even buy prints, keepsakes, and other fun things of your favorite photos and the proceeds go to camp! Click here to check out PLCBC’s Smugmug page! 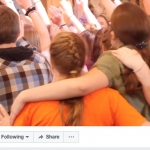 The Portage Lake Bible Camp Facebook page will continue to post photos (a selection from the photos found on Smugmug), videos, and updates throughout each week of camp. Make sure you “like” the page, and you can even “subscribe” to get notifications during the week your child is at camp! We will also occasionally be doing some fun live videos where you can see what’s going on at PLCBC right as it happens. There will be daily posts of what is happening at camp all summer long! Make sure you follow us and get excited for a constant stream of photos and videos! 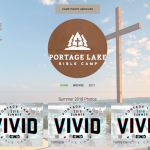 And remember, if you are a family camper, or dropping your camper off and want to use the hashtag #VIVID2018, others will be able to check out what is going on during summer 2017 at Portage Lake! We will also be posting to our “Instagram Story” so get excited for boomerangs, videos, photos, and other happenings during the day! You can find stories on the top row of the Instagram app, or you can click on our profile picture to see if we have an active story. The weekly highlight videos will not be posted online until later this year, but as fun and silly videos are made by our creative media team, we will share them on camp’s YouTube channel! Check it out from time to time and see what’s going on at camp! Click here to check out the PLCBC YouTube Channel! We understand it can be tough sometimes to have your kids away for an entire week, but we hope these resources can help you feel connected to their experiences from afar!